Flying into heathrow and looking for air B&Bs in decent areas. Thought some of our U.K. Members might point me in the right direction... especially after reading the London scooter crime thread. Specifically, what are a few quaint and quiet surrounding areas of London easily accessible to public transit - I'll likely get an Oyster card? If you're looking to travel around, you could do a lot worse than renting a bike from these guys (unless you have family in tow). Easy to deal with, great bikes, great blokes. An easy trip from Heathrow to Chichester. https://westsussexmotorcyclehire.co.uk. But of course, that doesn't answer your question at all. I avoid London like the plague. I like south west London around Richmond and Kingston (Hampton court palace, Kew gardens) my wife comes from that area. London has so much to offer the visitor it's hard were to start with advice . If you want peace and quiet than maybe a major city is not first choice. Good time to come though, the pound is tanking due to Brexit so enjoy. I'm not sure that quaint, quiet and London are happy bed fellows! I'm sure you'll be fine in London. Take the usual precautions you would in any crowded area and don't stand on the edge of the road mindlessly looking at your iPhone 27 (or whatever it is) asking to have it nicked, and you'll have a terrific time in our capital. So much to see and do there........ which can be a bone of contention for those of us like Molly and I that live out in the hinterland! Depending on how much time you've got two things, the UK and Europe are relatively small i.e. crossing a sovereign boarder is not a massive effort. The other thing they do trains like no where else, except possibly Japan big distanced on mass transit is not just possible but probably preferable. I think you will be missing the best scenery the UK has to offer if you don't visit at least one of the other 3.................. .Scotland, Ireland or Wales, or possibly the Lake District in England (IMHO). If time limited Wales is your probably your best bet as it's nearest. As far as the South East I cannot help, as I avoid the area, way too crowded for my tastes. Make sure you take the Heathrow express train to get into central london, by far the quickest way. And it usually works. There are usually a few offers of temporary accomodation from forum members that I see when visiting Europe on the bike. A couple I have yet to avail myself of, but there could be something crop up here..
Take the Piccadilly line (purple colour) for the best way into London Central. Why spend more than two days in London? It's just another big city with a few interesting sights that can be taken in within that time. Maybe use it as a base, though it's expensive. Head for Cambridge, Oxford, York, all interesting and historic cities. Go to Scotland or Wales. Would you recommend that a visitor to the States spends any length of time in New York? That wouldn't give him a proper view of your country, and London won't give a proper view of the UK. I found spending time further north in New Castle on the way to Scotland very nice outside of the big bustling London town. 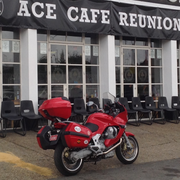 I would also add the ACE cafe as a visit spot. 2012 Victory Cross Country Tour. I expect to be lambasted for this, but I'm starting to get excited..! You haven't told us what you're into. Location: South London - home of the world's best football team. I've been in London for nearly 40 years, but unlike my wife an kids I'm not a native - I'm a Welshman. My advice is pretty straightforward. If you want quaint and quiet, don't bother with London. Go to Devon, or Wales, or the Yorkshire Dales or any number of other places. Cottswolds is nice too. If you want to go to London, go to London. Don't bother trying to find somewhere on the outskirts. The outskirts are just an urban sprawl, and it's not that much cheaper out there. It's just nasty. Stay in easy striking distance of the West End. Then go on a river boat trip to Greenwich for lunch. See the meridian, and the Cutty Sark and the amazing market. Don't get suckered by tourist traps like the London Dungeon. If you've got a Visa debit card, you don't need an Oyster. Stick to your plans of visiting London. It's a great city with lots of attractions, stay a week! I second the recommendation of taking the boat to Greenwich on a nice day. I'd make a day-trip out of it. Sorry I can't help you with suggestions for "decent areas." There should however be cheapish central hotels - might be worth it to save on travel time! No extraordinary precautions required, just good common sense. I can recommend the St Giles Hotel as inexpensive and very well situated, just off Tottenham Court Road a couple of minutes walk north of of the Oxford Street junction. Just about everywhere is within walking distance, as my poor feet have told me on several occasions. Or a bit more expensive are The Fielding, near Covent Garden, or The Rookery, close to Farringdon tube station. But I stand by my original comments about London. Even Paris or Rome can't enchant me for a full week, and London can't compare to either. Three days max. Mr Pootle - if it were just me, I'd roam the English countryside. The history and mythology has always fascinated me... I'd love to wander up through Northumbria to York and up past Hadrian's wall to Scotland, then back down the west side of Britain through Wales and the various places south that claim either legendary Arthur or Robin Hood. But, its not just me. Even so I'm excited to see London... at a slower pace. pebra- I like your suggestion of taking a boat to Greenwich as a day trip. I'm sure Greenwich has plenty to see. As a science geek I'm sure it will be fantastic. Trogladyte - London is it, though as previously stated, perhaps I'll see more of your magnificent island on another trip. Steph - I'm not particularly 'into' anything this trip... we just visit a 'new' place. Lazlokovacs - Thanks for the suggestions, I've highlighted Kew Gardens and Richmond on my transit map... its not too far from the airport, which is a plus. Hampstead is right on a transit line and I like the idea of staying in an ancient village - If I see a '90 Le Mans I'll give a shout out. I'll be the older guy with the white beard accompanied by my 20 something daughter (the trip was her idea). Nick949 - Thanks for the rental bike guidance. Not this time, but you never know when I might get a chance to. Why London? My daughter wants to see London (she did a DNA test and found she is about 30% British - she must have gotten that from me since her mom is 100% Japanese - I didn't really know half my ancestry ....my father was adopted). She wants to see if she 'connects' with Britain and meets some nice people. Ancestry DNA tests are funny things. I think they raise more questions than provide answers. Besides, we're all pretty mixed up at this point. That's the real point of the trip. We'll enjoy London, though I personally would have preferred Old Quebec City... another time. She wants to see if she 'connects' with Britain and meets some nice people. wwwrrright………. So perhaps you should add Scotland, Sunderland, Yorkshire [ … ] to the schedule? Ah ah, careful what you wish for! In central London try and find time for breakfast, lunch or dinner at the Bike Shed in Shoreditch - cool bikes, cool clothing and a great menu. If cool bike shops are your thing you could then wander over to Rebels Alliance after visiting the Bike Shed. Make sure you grab a beigel at the Brick Lane Beigel Bake whilst in the area. Same side of town, Sunday mornings only, its worth visiting Colombia Road flower market. Bit touristy but you can take a Jack the Ripper tour which can be quite interesting as they take in lots of old narrow streets that you'd never find yourself, likewise a graffiti tour of the area is interesting. Stop of at the Pride of Spitafield after the tour for a pint in a proper old school pub (very hard to find in this achingly trendy area). A bit further out in Stoke Newington is Bolt Motorcycles, say Hi to Andrew if you decide the trek is worthwhile. Poppies in Hanbury Street for proper Fish & Chips. Leadenhall Market has some interesting architecture. Go slightly south to Broadgate Market (next to London Bridge) for amazing food. Portabello Market on Saturdays will delight your daughter, Camden or Brick Lane markets on a Sunday are full of bright young things. Science museum has free entry. History museum next door is also free to enter. The Tate Modern is brilliant for anyone with a passing interest in art - be aware, its free to enter but you have to pay to see certain exhibits. Most art galleries and museums are free to enter and often have a nice cafe for lunch or snacks. The shop Liberties (nearest tube is Oxford Street) is an amazing building internally and externally and you can relive your youth around the corner in Carnaby Street, then duck down into Soho and then into Covent Garden which is pretty & very touristy. Lots of independent retailers in all of these areas. All of the central parks are nice but check out the view over London from Parliament Hill. Hire a 'Boris' bike and explore - you can pick up and drop off at numerous locations all around town. Sorry, no suggestions on where to stay, accommodation is desperately expensive, even if you choose AirBnB, just be careful and read on line reviews, cheap hotels are often dirty, noisy and uncomfortable. Travelling from one district to another on the tube takes time, London is a big place, avoid the tube during rush hour, its not worth the grief! If staying in London for a week or so then get a travel pass, Oyster is good but check out the cost for a weekly pass, it might save you money. London is full of history and there are some really old areas that are worth visiting. When you know where you're staying come back and I'll try and give you ideas local to you. I would suggest for hotels, check out the Choices Group. They have a loyalty card ( as I found out last year travelling up the east cost of America) which reduces the cost of hotels dramatically. The card works globally. Westminster Abbey. Where most of the Kings and Queens of England are buried. Houses of Parliament. Tours should be pre-booked. St Pauls Cathedral. Go to the top, the view is pretty good. If views of London is of interest, go to the Shard. The view of London at dusk is fascinating. The Tower of London is worth awhile, with the crown jewels on display. Next door is Tower Bridge,which is interesting. Just over the river is Butler Wharf. From there you can walk along the south bank of the Thames towards the London Eye. Several period style pubs along the way, with HMS Belfast on the way. The Globe Theatre is on the South Bank. Book a tour. Part of Buckingham Palace is open to the public. Greenwich has been mentioned, the river trip is interesting. Go on one with commentry, can be fun. In Greenwich its self, the market is ok, but the old Naval College is beautiful. Again, as mentioned, the Maritime Museum in Greenwich is worth while, as is the observatory. The views from the park of the Thames are great, but I'm biased, I proposed to my wife at the top of the park! All the markets mentioned in other posts are worth visiting, and very diverse. The bagel shop in the East End mentioned early is a must. Best bagels ever! Finally, compared to Los Angeles, London is compact. You can move around easily using the underground. Your plan of an Oyster card is good, although you can use a debit card as well.